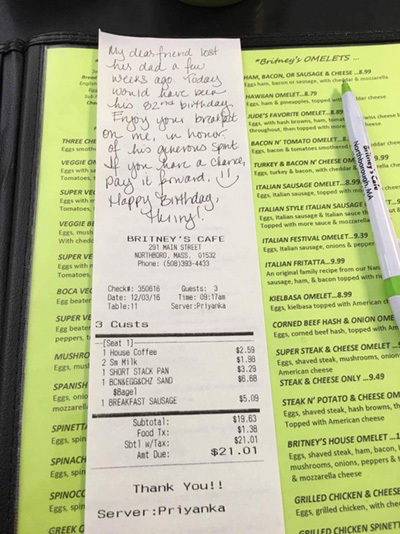 In honor of what would have been my father’s 82nd birthday, my sister’s friend, Lisa, decided to extend a gift of kindness to a stranger on behalf of my dad by paying for his breakfast. Everyone who knew my father knew he received so much joy giving to others. He was actively involved with the homeless organization connected to his church, and every week he gathered food from local stores and restaurants so volunteers could distribute meals to those in need in downtown Boston. He also loved giving unexpected surprises. As a young woman, I saw him deliver miniature Christmas trees to elderly clients who couldn’t drive. Or, I’d watch him hide a $20 bill under his cup so the waitress at his favorite coffee shop would find it when clearing the table after he left. When my dad worked three jobs to support our large family, he always found a way to share his wealth even if he didn’t have much left over. He taught us that giving wasn’t weather dependent. You gave because it was the right thing to do. Dad was a wonderful teacher in this way and I learned to trust in the abundance of the Universe because of it. When I started my own business years ago, I made a point to donate to charities precisely at the times when I was most frightened about making ends meet. It was my way of challenging my scarcity thinking and the Universe always came through. At my father’s funeral, when my brother Steven was about to finish his beautiful eulogy, he asked audience members to perform an act of kindness in memory of our father. This week, I’d love to pass his invitation on to you. If you feel so inclined, join me by doing something special or unexpected for a stranger. By the way, Kerri’s friend, Lisa, said that after she paid the check for the man in the restaurant, her gift was paid forward seven times before she left the restaurant. Now that’s how we make the holidays happy . This week’s video makes me smile every time I watch it. I suppose you could think of it as background music while performing surprise acts of kindness for strangers. You can watch it here.